Additional Info: 'WestEnd Piano Tuning, where all pianos ~ the old, young, the short and tall, arthritic, even the wan and the dissonant receive professional qualified service and repairs! 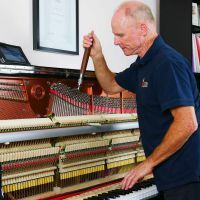 From Newport in Melbourne’s inner Western Suburbs, WestEnd provides qualified piano tuning service & general repairs to all Western and Northern Suburbs, Melbourne Metro and Geelong. WestEnd can make your piano a joy to play, again! Jamie is a graduate of the Australasian School of Piano Technology in Melbourne where he trained in aural tuning, voicing, regulation and piano repair under ASPT principal, Brent Ottley, former Senior Concert Tuner and Technician for Yamaha Australia.